- Available in Sizes 6 - 16. 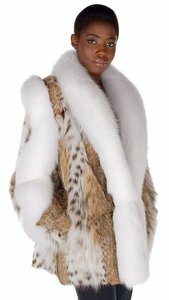 - Fur Description: Natural Lynx Fur Coat. Natural White Fox. - Fur Origin: U.S.A., Finland. - Fox Trimmed Coat With Side Seam Pockets.